I'll be posting a series on Route 66 over the next three months, but a recent trip to California and the "end of Route 66" prompts me to begin with what really should be the final episode. However, as I've traveled many sections of Route 66 over the years, I've found that it doesn't really matter where you start as there are treasures all along the way. As glamorous and vibrant as the Santa Monica Boardwalk is today, it's hard to believe that it really had a stinky beginning. 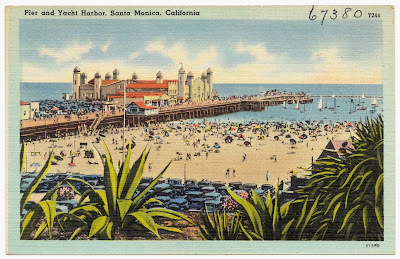 Santa Monica, as part of the greater Los Angeles area, sits on the edge of the Pacific Ocean, and by the beginning of the twentieth century the city had grown by leaps and bounds. So much so that disposing of sewage waste had become a problem. The idea was proposed that they would build a 1600-foot long pier with a pipeline running under it to carry treated sewage to the Pacific Ocean (a practice that was stopped in the 1920s). The project was completed in 1909 with much fanfare. 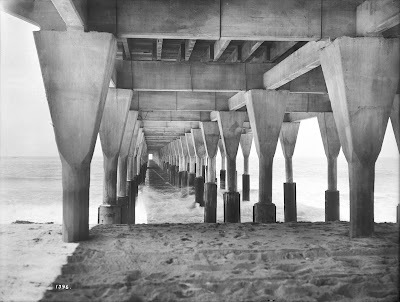 To obscure the real purpose behind its creation and to avoid the pitfalls of wooden piles, the pier was made of concrete - the first concrete pier on the West Coast. Thousands of people attended opening day complete with a tableau vivant performance entitled The Surrender of Rex Neptune. 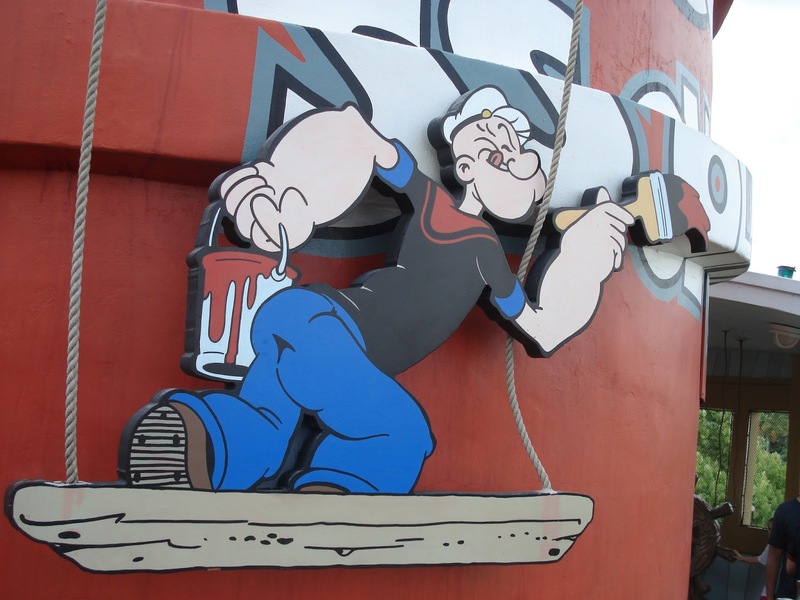 At dusk, the mighty king of the sea (Rex Neptune) climbed onto the deck and declared that he was there to destroy the pier. After the Queen of Santa Monica told him it was made of concrete and was impossible to destroy, Rex Neptune inspected it and admitted defeat. He then dove from the end of the pier into the ocean in a blaze of flames. The crowd loved it. The pier gained instant fame as everyone's favorite fishing spot as entire families flocked to try their luck. Stories of the 500-pound fish that "got away" circulated with some basis of truth to them as giant sea bass weren't uncommon in the waters of Santa Monica Bay during the early years of the pier. 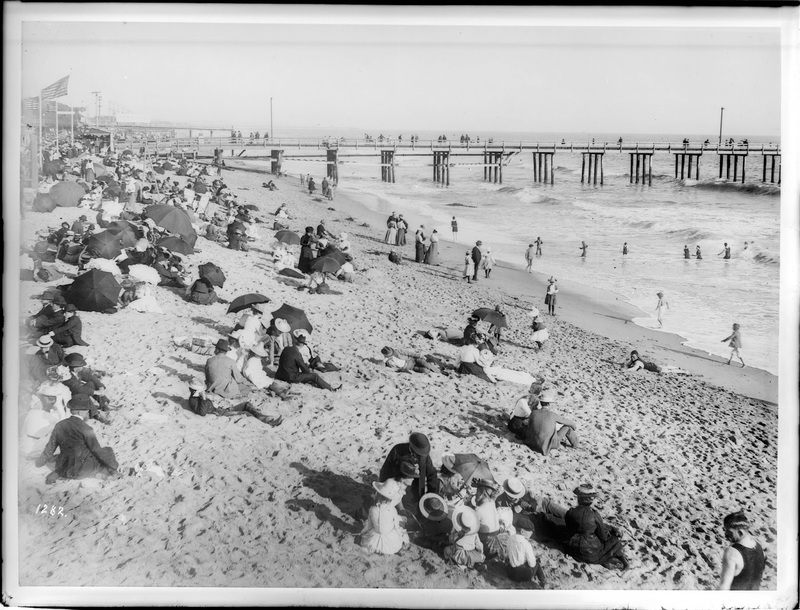 To "keep up with the neighbors" who boasted of amusement parks along the ocean, a second pier was built adjacent to the existing one in 1915. Dubbed the Looff Pleasure Pier, it boasted a carousel, roller coaster, Bowling and Billiards building, a fun house, and a new picnic pavilion. It was a top local attraction until 1919 when the pier collapsed. It turned out that the concrete piles weren't meant to last and rust caused the pier to drop two feet. Repairs took more than two years. The new pier gave way to a wooden boardwalk over the concrete, but the amusement park waned in the early 1920s. The La Monica Ballroom which looked liked a floating castle was built and was the hot spot in town until the Depression years. In 1925, Olaf C. Olsen, a retired sailor started a small boat fishing operation and worked to keep the large commercial operations away from the Santa Monica Bay. During the Depression, he donated part of his daily catch to those who needed food. Elzie C. Segar, a cartoonist who was a regular at the pier, found in Olaf C. Olsen a real life hero for his comic strip Thimble Theater - the character we all know as Popeye! The rest is history. In 1934, the Santa Monica Yacht Harbor, was fashioned to host a highly publicized sailing regatta. 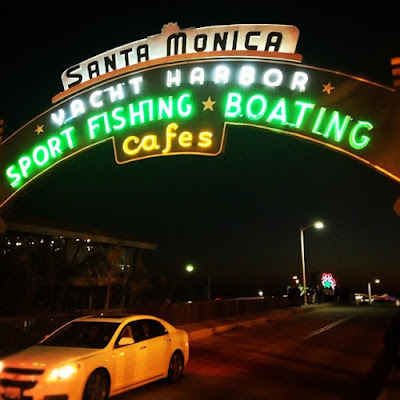 The yacht harbor attracted the likes of Charlie Chaplin who had a mooring there, and in 1941, an archway was constructed at the entrance with neon lettering - "Santa Monica Yacht Harbor" - The arch has since become an iconic symbol. 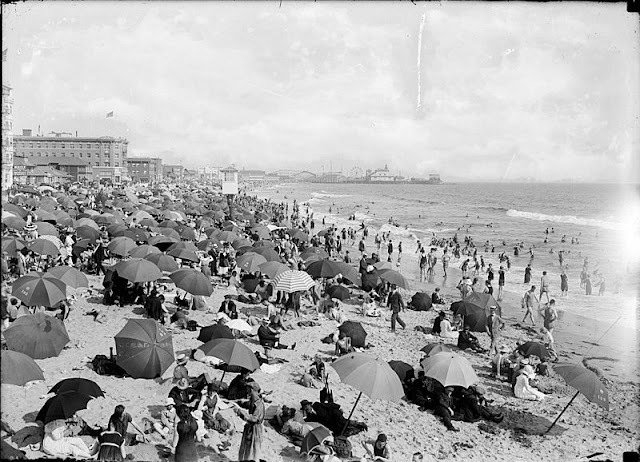 A Lifeguard Service (and training center) was started in the 1920s and remained for several decades. Buster Crabbe and Johnny Weissmuller - both actors who played Tarzan on the big screen - were inducted as honorary lifeguards. Other attractions were Paddleboard Clubs - an idea imported from the Hawaiian Islands, gambling barges, and a resurrected amusement park. Wartime activities at the pier during WWII included local commercial fishermen dumping their catches on the pier to be loaded onto navy vessels and sent to feed our troops. Some of it was trucked to feed the American people as well. Federal assistance had to be brought in to help with the wear and tear that the relief operation had on the pier. At the end of the war, the La Monica ballroom saw new signs of life with bookings by Desi Arnaz and Western Swing bands. It was also the site of the first-ever live broadcast of a television variety show. By the 1960s, the attractions had deteriorated and the clientele had gotten pretty seedy. Activists and Hollywood stars worked diligently to keep the spirit of the pier alive until a "Save The Pier" campaign was started in 1972. Renovations were done, but in 1983 a fierce winter storm assaulted the pier destroying one-third of it. A full-scale restoration project ensued, and the pier has had a busy life ever since. The end of Route 66. That's what I'd come for - to have my picture made here. It turned out, though, that the entire afternoon on the pier was a pure delight with the salty sea breeze and swarms of people who'd come out for a day of fun! 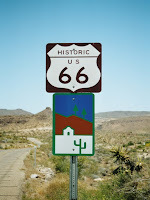 I can't wait now to share more Route 66 wonders with you in the next few months. Until then, how about you? Have you been to the Santa Monica Pier or any other spots along Route 66? Care to share some of your memories? I'd love to hear them. Research source for this article: The Santa Monica Pier website. All photos except personal ones courtesy of Wiki Commons. That's a neat post, Carla! 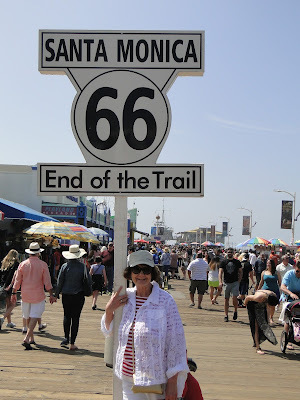 I've never been to Santa Monica or anywhere else along Route 66, being an East Coast girl. 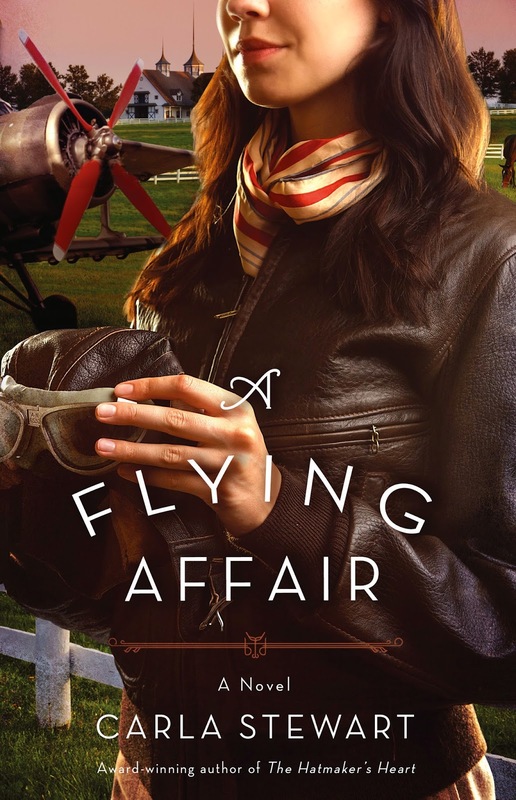 I enjoyed reading the storied history of the pier. Thanks, Rebecca! I'm sure you have some great stories about the boardwalks on the East Coast. Something about them is just fascinating to me. Cheers! Back in 1970 I accompanied my parents on a route that took us from Tulsa OK to Orange County CA. Part of that route was on the Interstate but there were also parts that were the old 66. 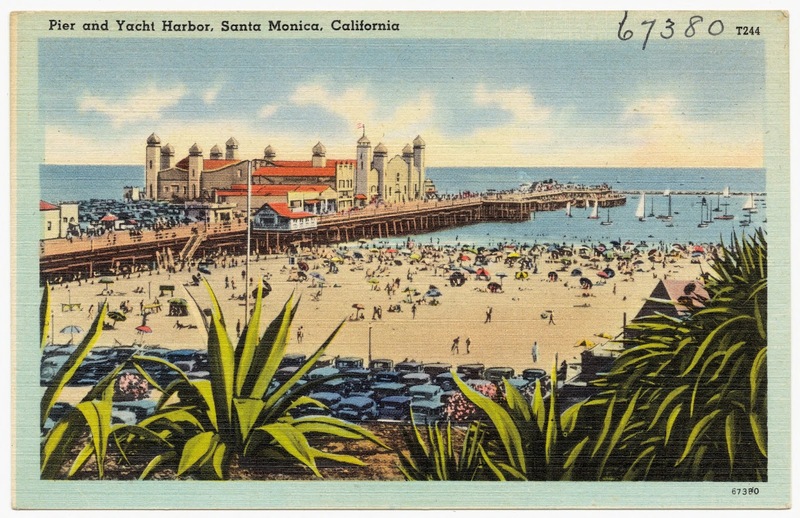 I settled in LA where I lived for seven years and spent a lot of time in Santa Monica. At that time the pier wasn't what it is today with a Ferris wheel and the other rides. But, I love the park that runs parallel to the beach, and you can never tire of being near the ocean. Although I live close to Lake Michigan now, I rarely make the 30 minute drive east to view it. I was always fairly close to the ocean while living in LA and enjoyed that so much. Thanks, Carla, for my trip down memory lane and to learn more of the history of the pier. Aw, Pam, so glad this stirred up some good memories for you! Like you, I've been on parts of Route 66 but I'd never been to Santa Monica. Thank goodness, my hubby is understanding about my quirky requests to visit different places. He loved our day at the SM Pier, though! There is something about the ocean air! I grew up out there and spent a lot of time on that pier with friends, especially when I was in high school! Wow, that must have been fun, Ane. The beach there is wonderful - sand and water for as far as you can see on either side. And now there's a Bubba Gump's Seafood restaurant on the pier. Yum! 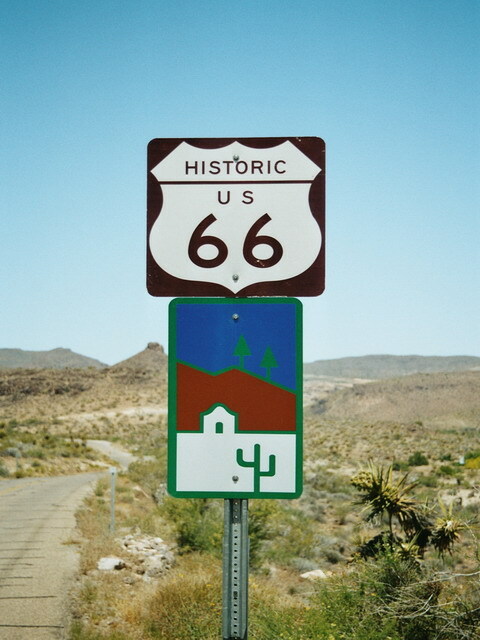 My family made a few trips from OK to CA when I was growing up so we always went on Route 66. Great memories. Yes, Sharon, the sewage practice stopped in the 1920s but I don't know how they disposed of it then. Stay tuned. I'll be bringing more fun posts about this fun road in the next few months. I've been to the Santa Monica pier. It's a fun place to visit. Somehow I totally missed the fact that it is the end of Rt. 66. I'm pretty sure that sign wasn't up when we were there.